On a beach in southern England, a dog returns to its owner with a human hand in its mouth. The hand belongs to a homeless eccentric named Henry, who has been wandering the south-west of England for the last thirty years. As the local policeman and his accomplice piece together Henry’s movements prior to his death, talking to those who knew and watched him, they uncover an extraordinary life. And as the story of Henry’s life becomes clearer, so the life of the narrator becomes more and more complex, in ways he could never have expected. 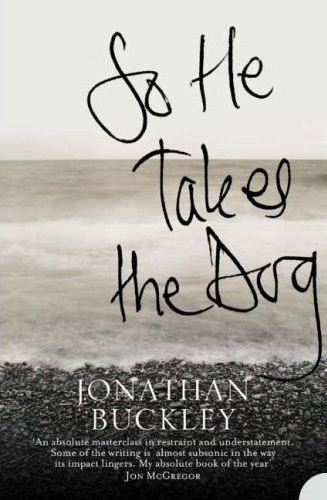 ‘So He Takes the Dog’ is a detective story like no other, a novel that further confirms Jonathan Buckley as one of the finest writers at work in this country. The chief pleasure of this extremely subtle novel is how [the narrator] reveals any information. . . There are revelations, sure – particularly a shocking one late in the book, so delicately delivered its impact is like a depth charge – but this is mainly a portrait of a reluctant talker and of his town and of his marriage. And what a shrewdly observant voice it is. . . there is a gentle but persistent pull in how Donohue takes his time, obsessively avoiding calling attention to himself and letting the story unfold. It’s rare for a contemporary novel to take such care, to defer to such reticence. So He Takes the Dog is a testament to the power of the modest, the gracefulness of the still. Jonathan Buckley’s style has a surprising humanity and patience that verges on the feminine . . . brave, unsettling and brilliant. There are some lovely, slightly unsettling images – mushrooms blooming on the walls of a damp flat when the narrator and his wife first meet, a heron pursued by crows flying towards the sun – and a real sense of the rhythms of suburban life . . . [this novel is] about what it means to live in today’s Britain, about the slow drawing-in of dreams and the facing of reality and what happens when that starts to go wrong. George Orwell would almost certainly have approved. This melancholy, upside-down tale is so beautifully written . . . A hugely satisfying read. Buckley’s novel is subtle and gently paced after the shock of a visceral opening. He writes with real compassion about both the victim and those touched by their proximity to human despair. The result is intensely moving and haunting. These fractured lives are too close to our own to make for comfortable reading, but it is testament to Buckley’s writing that we can’t look away. A very well written and beautifully observed piece of work. Buckley has a rare talent for putting the oddities of modern day life into the spotlight. Affecting, carefully crafted, quietly tumultuous. The elusiveness of our emotionally stunted sleuth is its greatest achievement. This is a quiet, small-scale novel, but it is so packed with well-observed incident and arresting insight that it becomes deeply involving and ultimately very moving. Beautifully told, and gently weaved together, Buckley tells a story that will continue to haunt you long after you have read the last pages. An absolute masterclass in restraint and understatement. Some of the writing is almost subsonic in the way its impact lingers. My absolute book of the year.